There was a need in this country, we thought, of a quiet place where the advanced students and scholars could withdraw, the one to mellow and develop, the other to write the result of a life’s study. Dumbarton Oaks was created by Mildred and Robert Woods Bliss, collectors and patrons of art and scholarship in the humanities. Robert Bliss was a diplomat in the US Foreign Service, and the Blisses traveled and lived in South America and Europe. After a long search for a permanent home in Washington, they purchased the 1801 Federal-style house and property in June of 1920. Throughout their lives they were enthusiastic collectors of art and books and ardent supporters of music and the arts. After buying the property, the Blisses altered it significantly. Mildred Barnes Bliss worked closely with renowned landscape designer Beatrix Farrand to transform the land surrounding the house into terraced gardens and vistas. 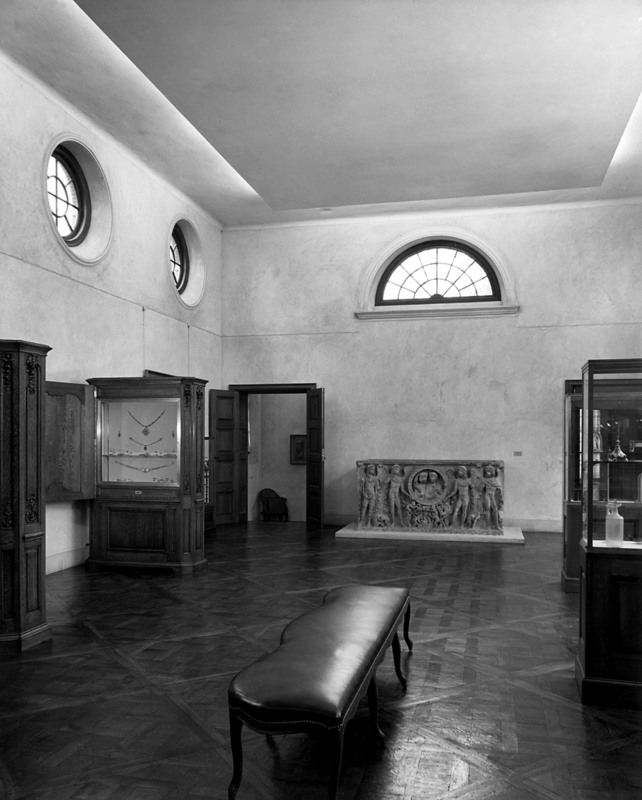 The Blisses renovated and expanded the original structure, adding the Music Room in 1929, and the wing to house the Byzantine Collection in 1940. As early as 1932, the Blisses had begun planning to convey the institution to Harvard, Robert's alma mater; the property was transferred in 1940. The Blisses remained very active, continuing to shape the institution, the collections, and the garden, until their deaths in the 1960s. The Pre-Columbian Pavilion, designed by architect Philip Johnson to house Mr. Bliss's collection of Pre-Columbian art, which had been on long-term loan to the National Gallery of Art, opened to the public in 1963. The Garden Library was added in the same year, to house and display Mrs. Bliss's collection of rare and modern books related to all aspects of the history of gardens. Dumbarton Oaks continues to respond to the need for change; in 2005 scholars were welcomed into the new library, and in 2008 the extensive renovation of the Main House and Museum was completed. Dumbarton Oaks is situated on land that formerly was part of a 1702 land grant patented by Colonel Ninian Beall (1625–1717) as the Rock of Dumbarton. In 1801, William Hammond Dorsey (1764–1818) acquired twenty acres from a Beall decedent and built a house, which survives, in part, as the central core of the present Dumbarton Oaks. The property subsequently passed through a series of individuals, including Vice President John C. Calhoun (1782–1850) and Edward Magruder Linthicum (1797–1869), who greatly enlarged the house. The Blisses acquired the house and six acres of land on November 15, 1920. They would eventually increase the size of the property to approximately fifty-four acres. Robert Woods Bliss was born in 1875 in St. Louis, Missouri, where his father, William Henry Bliss, was US District Attorney. He graduated from Harvard University in 1900 and began a distinguished career as a Foreign Service officer and diplomat. He eventually served as Ambassador to Argentina (1927–33). Mildred Barnes Bliss was born in New York City in 1879 to Anna Dorinda Blaksley and Demas Barnes, who had invested in the patent medicine Fletcher's Castoria, the phenomenal success of which made him a wealthy man. When Barnes died in 1888, his wealth passed to his wife and their only child, the nine-year-old Mildred. The second marriage of Anna Barnes to William Bliss in 1894 brought Mildred and Robert together, and they themselves married in 1908. Robert Bliss's career brought the Blisses to Paris in 1912. There they became friends with a circle of Americans, including the artist Walter Gay, the author Edith Wharton, and Mildred Bliss’s childhood friend, the historian, diplomat, and banker Royall Tyler. Tyler introduced the Blisses to Parisian art dealers and sparked their passion for collecting, especially Byzantine and Pre-Columbian art. In Paris, Mildred Bliss began to support musicians and host musical evenings. In 1920, the Blisses purchased the Georgetown property that they named Dumbarton Oaks. Their redesign of the house and the creation of the garden—directed by landscape designer Beatrix Farrand—made Dumbarton Oaks one of the outstanding residences of Washington. In 1940, the Blisses offered Harvard University the gift of Dumbarton Oaks, with its grounds, buildings, library, and art collections. Robert Bliss died in 1962, and Mildred Bliss in 1969. In 1938, the Blisses began to work with the architect Thomas T. Waterman (1900–1951) to design and build library and exhibition pavilions for the new institution. These were located to the west of the music room and incorporated mosaics from excavations at Antioch, which the Blisses had helped fund. The Blisses engaged Marvin Ross (1904–1977) to catalog the expanded Byzantine Collection, Elizabeth Bland (d. 1997) to register and help install the collection, Barbara Sessions (1899–1980) to assemble and catalog the research library (which by 1940 numbered some twelve thousand books), and Ethel B. Clark (1878–1964) to catalog Mildred Bliss’s collection of rare books, manuscripts, and holographic materials. They initiated the Census of Byzantine and Early Christian Objects in North American Collections, employing researchers Louisa Bellinger (1900–1968) and Elizabeth Dow (1911–2000) to undertake the task. They acquired for Dumbarton Oaks a copy of the Princeton Index of Christian Art and initiated the Dumbarton Oaks Papers in the hope that scholars would publish articles on objects in the collection. All of this was in place when the Dumbarton oaks Research Library and Collection was legally transferred to Harvard on November 29, 1940. In giving Dumbarton Oaks to Harvard, Mildred and Robert Woods Bliss provided little direction for the development of the nascent research institute. Their letter to Harvard’s president announcing the gift stated rather simply their desire that Dumbarton Oaks “be used for study and research in the Humanities and Fine Arts, with especial emphasis upon Byzantine art and the history and culture of the Eastern Empire in all its aspects.” They further expressed their hope that Dumbarton Oaks itself would become a center of research and a place of residence for scholars, students, and artists. The Dumbarton Oaks Research Library and Collection opened a little more than a year after the outbreak of the Second World War. At first, the war seemed to have little impact on the embryonic institution. However, with the Japanese bombing of Pearl Harbor on December 7, 1941, and America’s entry into the conflict, Dumbarton Oaks quickly shifted from the academic to the pragmatic. Dumbarton Oaks, in effect, reacted to and then joined the war effort: the collection was quickly packed and sent to various distant locations for safekeeping until the end of the war in 1945; use of the property was offered to relief organizations and then to the Departments of War and State, first to expedite the war effort and then to facilitate the establishment of world peace; a victory garden was maintained; and Dumbarton Oaks fellows provided the War Department with lists of potentially endangered sites, monuments, and artworks in Hungary, Bulgaria, Germany, Greece, Yugoslavia, Romania, and Tunisia in order to help insure their protection. These activities notwithstanding, throughout the war years the Blisses also continued to collect art in order to further improve the Byzantine collection that they had given to Harvard University. In the late summer and early fall of 1944, at the height of the Second World War, a series of important diplomatic meetings took place at Dumbarton Oaks. Their outcome was the United Nations charter that was adopted in San Francisco in 1945. 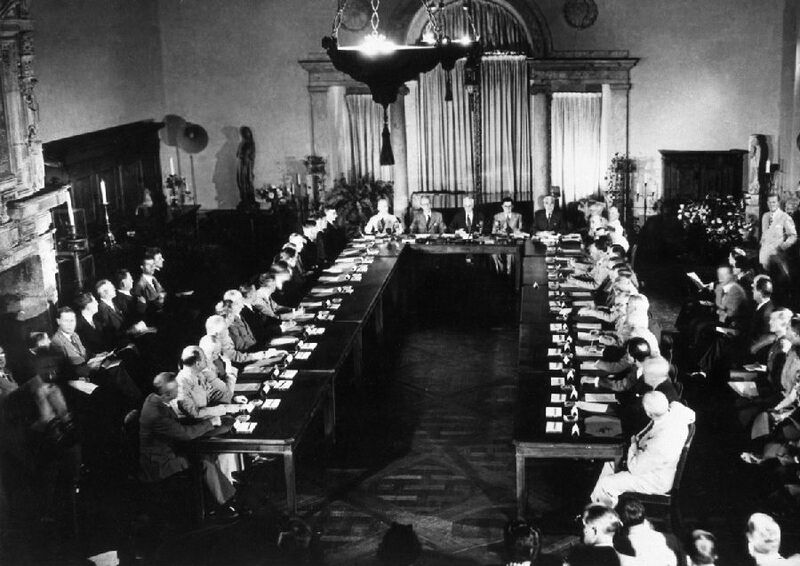 At these meetings, officially known as the Washington Conversations on International Organization, Dumbarton Oaks, delegations from China, the Soviet Union, the United Kingdom, and the United States deliberated over proposals for the establishment of an organization to maintain peace and security in the world. Among the representatives were Soviet Ambassador to the United States, Andrei Gromyko (1909–1989); US Secretary of State Cordell Hull (1871–1955); Wellington Koo (1887–1985), Chinese Ambassador to the United Kingdom; and Edward Wood (the Earl of Halifax) (1872–1959), British Ambassador to the United States, each of whom chaired his respective delegation. Opening session of the Dumbarton Oaks Conversations. Seated in the Music Room are the American, British, and Soviet delegations, from the National Archives, Washington, D.C.
Robert Woods Bliss was instrumental in arranging these meetings. Already in June 1942, on behalf of the Director of Dumbarton Oaks, John Thacher, and the Trustees for Harvard University, he had offered to place the facilities at the disposal of Secretary of State Cordell Hull. When in June 1944 the State Department found that Dumbarton Oaks could comfortably accommodate the delegates and that the environment [was] ideal, the offer was renewed by James B. Conant, then President of Harvard University, in a letter of June 30, 1944. The conversations were held in two phases. In the first, representatives of the Soviet Union, the United Kingdom, and the United States convened between August 21 and September 28. In the second, representatives of China, the United Kingdom and the United States held discussions between September 29 and October 7. Since the Russian and Chinese delegations could not meet at the same time and at the same place, the organizers took pains to hold the talks with the Chinese at the same place or at an equally glamorous site as where the conversations with the Russians were held. The delegates agreed on a tentative proposal to meet these goals on October 7, 1944. In his Witness to History, 1929–1969 (New York, 1973, 159), C. E. Bohlen observes that Dumbarton Oaks settled all but two issues regarding the organization of the United Nations—the voting procedure in the Security Council and the Soviet pressure for the admission of all sixteen of the Soviet republics to the General Assembly. It took the conference at Yalta, plus further negotiations with Moscow, before the issues were solved.